The soldiers and marines are packing their bags. The pilots are sitting on the tarmac. But the armed robotic planes are busier than they’ve ever been: Revised U.S. military statistics show a much, much larger drone war in Afghanistan than anyone suspected. 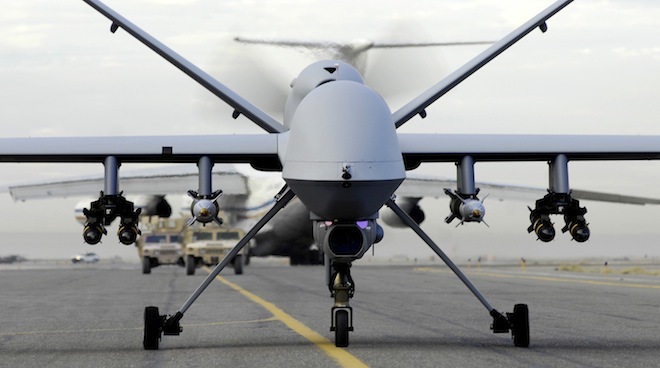 Last month, military stats revealed that the U.S. had launched some 333 drone strikes in Afghanistan thus far in 2012. That made Afghanistan the epicenter of U.S. drone attacks — not Pakistan, not Yemen, not Somalia. But it turns out those stats were off, according to revised ones released by the Air Force on Thursday morning. There have actually been 447 drone strikes in Afghanistan this year. That means drone strikes represent 11.5 percent of the entire air war — up from about 5 percent last year. Never before in Afghanistan have there been so many drone strikes. For the past three years, the strikes have never topped 300 annually, even during the height of the surge. Never mind 2014, when U.S. troops are supposed to take a diminished role in the war and focus largely on counterterrorism. Afghanistan’s past year, heavy on insurgent-hunting robots, shows that the war’s future has already been on display. It’s not just that the drone war in Afghanistan is so big. It’s that the broader air war is winding down. 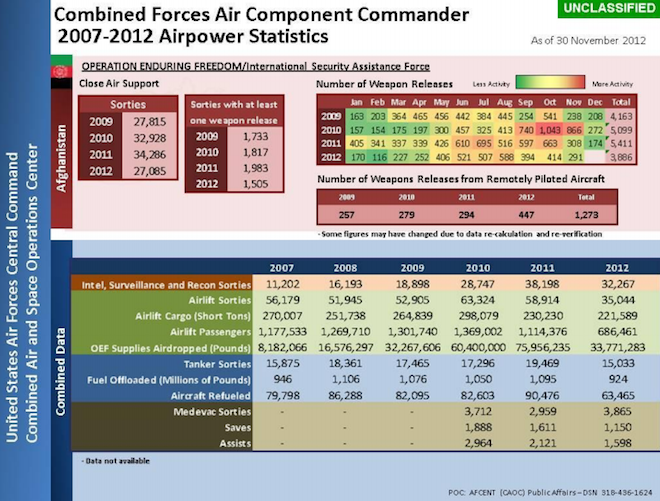 As the chart above shows, the Air Force flew fewer intelligence, surveillance and reconnaissance missions in 2012 than it did in 2011, although the number of spy missions in 2012 is still greater than in 2010 or 2009. This year has seen over 1,000 fewer aerial attacks, by manned and remotely piloted aircraft alike, than there were during the surge years of 2010 and 2011. Total sorties are even lower than their 2009 levels. The only exception to the downward slope: drone strikes. That suggests a pattern that may endure through the next two years of troop reductions. As the humans leave, the robots take up the slack. The U.S. and Afghanistan have begun negotiations on what a residual troop presence is supposed to look like. So far, it’s believed that the Pentagon wants to leave behind between 5,000 and 10,000 troops, to continue to train the Afghan military, hunt terrorists and generally ensure Afghanistan doesn’t collapse. And before the New Year, Gen. John Allen, the outgoing commander of the war, is supposed to recommend to President Obama how fast next year’s troop drawdowns ought to proceed. Pentagon officials insist nothing’s etched in stone. But we might not have to wait for 2014 to see the future of the Afghanistan war. “We may well see the development of counterterrorism become more important as time goes on,” Allen told the Senate last year. This year proved Allen wasn’t blowing smoke. U.S. special operations forces underwent a major command overhaul and now operate out of a private base run by the company formerly known as Blackwater. Super-sizing the drone war is fully in line with that broader shift. This may have been the year of the drone in Afghanistan, but the drones aren’t going home any time soon.